DECEMBER 4--A veteran Minnesota middle school teacher left sexually suggestive notes in the lockers of two female students and was typing a third lewd letter when school officials confronted him in his classroom, according to police. Martin Bartels, 53, was named Wednesday in a misdemeanor complaint charging him with disorderly conduct in connection with letters found last month by two seventh grade students at Buffalo Community Middle School. According to this District Court criminal complaint, Bartels, a band teacher who has taught for 28 years, wrote in one letter that he wanted to "trace your thighs with my fingertips and make you squirm," adding that he gets "hot and hard just thinking about it." In a note to a second girl, Bartels wrote, "I really, really, really love your legs...I like how you show just enough to make me hard." After the students reported discovering the notes, school administrators reviewed surveillance video and spotted Bartels leaving items in the lockers. 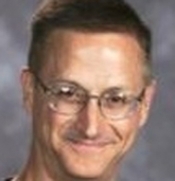 Before confronting Bartels, the school's principal walked past his classroom and saw him typing on a school computer. Aided by the school's IT director, the principal was able to remotely access Bartels's computer, which yielded a third letter that was intended for one of the girls he had anonymously already written. That missive commented on the girl's short skirt, her curves, and how "I will have very nice dreams!"